The envelopes are printed on the inside so that in spite of the thin, transparent paper, the contents are kept safe from prying looks. Instead of being gummed, the flap of the envelope is furnished with an adhesive strip which does not have to be licked and which holds longer, too. 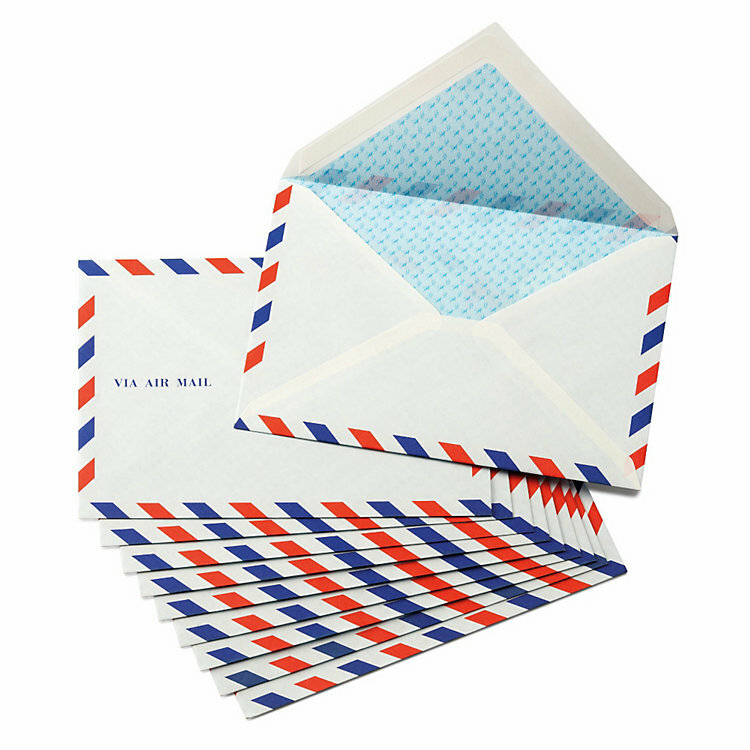 10 envelopes in the classic airmail design with red white and blue diagonal hash marks on the edges. 16.2 x 11.4 cm. Made in Japan. In Appreciation of Aesthetic Qualities. Practically speaking, using writing pads and envelopes made of airmail paper has become meaningless. But somehow there is still an affinity to it. Unlike the many other widely available writing pads and envelopes, these are truly manufactured like the originals, namely from very thin paper (even if the stripped down letter weight formerly striven for is no longer relevant).